ONE (1) Piece of Micro Fiber Suede cut to 3 Feet. Water proof and Sweat Proof, this 3 foot piece of 3mm wide x 1mm thick specially treated soft, velvety microfiber faux suede looks like leather only better! It will not crack, weather or smell and it washes easily with warm, soapy water. Your ONE (1) Piece of 3 Feet Micro Fiber Suede will arrive without knots on the end and in a tiny organza bag for safe shipping. Choose your color from the Color Chart. 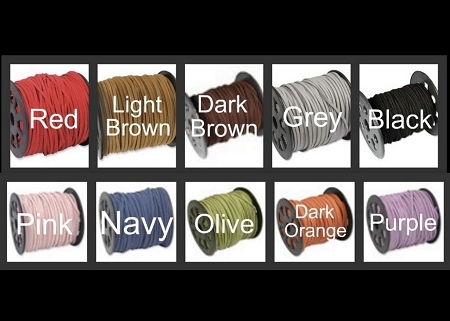 Choose Red, Black, Dark Brown, Light Brown, Grey, Pink, Navy, Olive, Dark Orange or Purple. 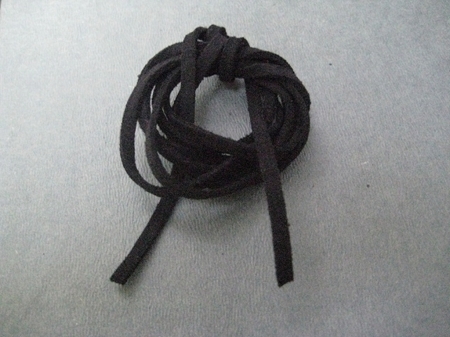 Add a Charm and tie it around your neck to wear as a necklace, wrap it around your wrist or tie it on your shoe! If purchasing mulitiple CHARMS and MICRO FIBER SUEDE at the same time, please let me know in the NOTE TO SELLER on the checkout page if you could like me to add your CHARM(S) to your MICRO FIBER SUEDE. If no note is left at checkout, your ONE (1) MICRO FIBER SUEDE will arrive in a tiny organza bag.